Well, not quite, but I do love my new royal blue dress. Or is it purple? I can't be sure, but it's lovely either way. The pattern is Burda Style 7376... the first Burda pattern (magazine, pdf or print) I've ever used, but it was so easy to make I'm almost embarrassed I used a pattern at all. Good thing I bought it for only $2.99 or whatever when JoAnn was having a rare Burda sale. I figured with such a simple yet elegant design, there'd be a lot of these circulating the blogosphere, but I only found two (Byrdie Couture and Carry on Dancing). Two seems like a scant number compared to the thousands of Colette Ginger skirts out there. I'm a regular ole trailblazer. 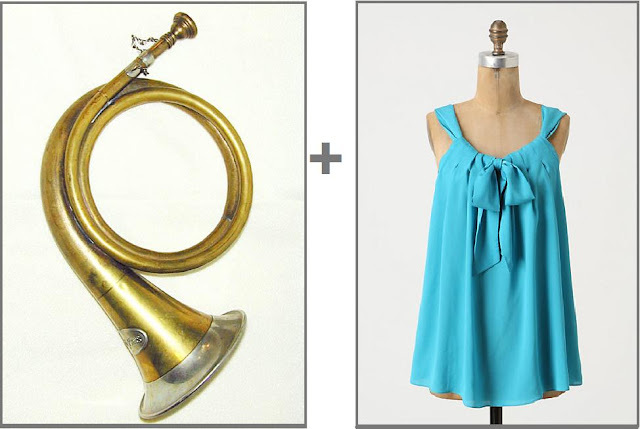 This dress has NO closures. Rad. It has a V-front and back, so it's easy to slip over the head. From there it's just a tent shape. The only other design elements are the tucks on the shoulders and the two back darts for better fit. There's also the waist tie that's supposed to be sewn into the back darts, but I eliminated that in case I wanted to wear a dressier belt. Mine's also a couple inches shorter than the dress was meant to be. My favorite thing about this dress is that I can wear it for almost any occasion or season, depending on simple changes in styling and accessories. I made the front neck about an inch lower than the pattern. It looked fine on the model's dress on the pattern envelope, but the model's tunic neckline looked much higher so I was afraid it'd turn out that way. I like how the V looks straight on, but the interfacing and front facing make the top heavy enough to gape easily, so I will have to wear a camisole. The fabric is challis of some kind -- I think rayon, not cotton. I would completely adore it were it not for the wrinkle factor. After a 45-minute car ride I was pretty rumpled. But, it's the perfect weight, texture, softness and drape for this kind of dress. And the color is bomb. ...Eyeing a pedestrian on the sidewalk out front, hoping they won't catch me hovering in my doorway for seemingly no reason. I hate posing right there, but the rest of my apartment is as dark as the dickens. In other news, yesterday I welcomed a new baby Brother into my life. This thing is just as mysterious to me as real human infants are. Wish me luck! 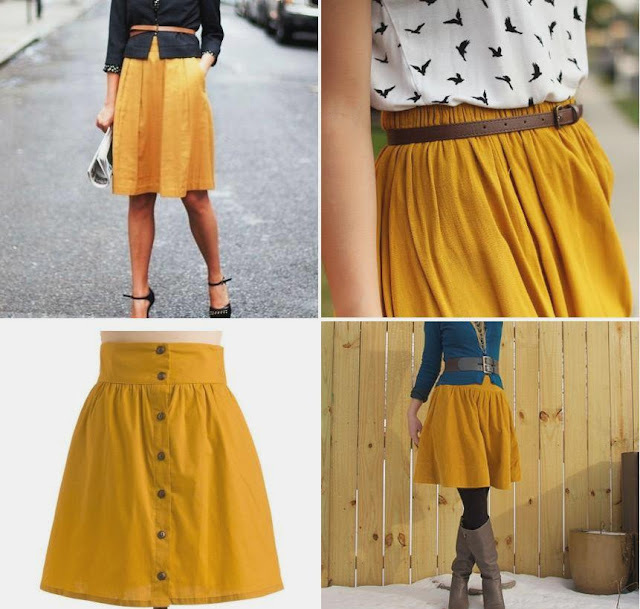 I'd been pining after (and pinning) mustard-colored skirts all fall. So, naturally I wait until the first (second?) official day of winter to make one. It's more like gold, I guess, or honey mustard. 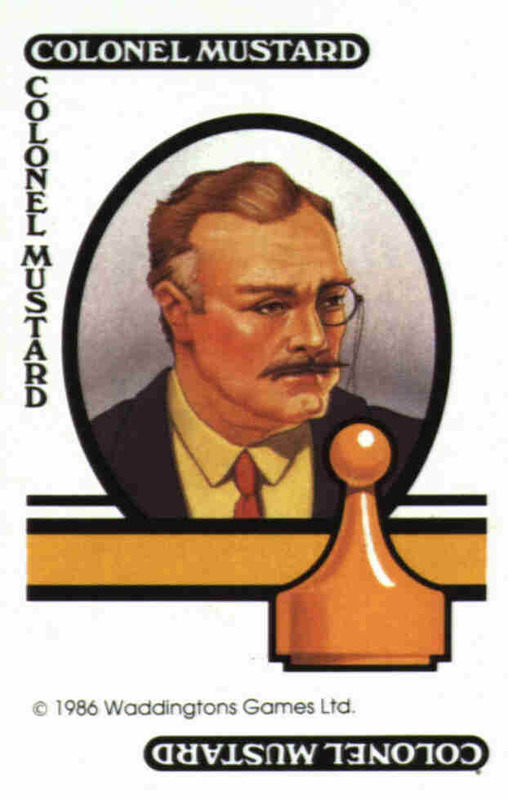 Or Colonel Mustard, sans monocle. Wikipedia describes him as a "colonial imperialist." Sounds like someone I'd love to invite to my mansion parties. I used Simplicity 2226, one of those "learn to sew" patterns. I'm trying to pump out some simpler patterns while I gear up to make the Colette Negroni next on my list. Menswear, yikes. Matching plaids, yikes. Continuous laps, yikes. Sewing something fitted for someone else, yikes! I like how the pattern model is entranced with the instructions, even though she's already wearing the skirt she just made. She's like, "Now, how do I post pictures of my boring skirt on Blogger?" Girl, I'm on it. I took two inches off each side of the back pieces to eliminate some fullness in the gathers. 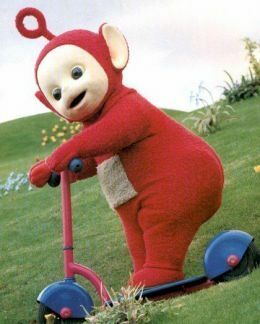 I've learned my lesson about Teletubby bums. The blogger Noodlehead recently held a sew-along for this skirt. Even though I missed it at the time, I referenced her instructions along the way. Her linky party's still open for another day, so I'm going to toss this on up there. 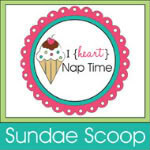 Today I had the honor of guest blogging for the wonderful Janny at Que Linda. There's a tutorial on how I made a versatile drape shade for my bathroom window. Check it out! Have you already finished all your holiday shopping and crafting and cooking? Of course you have! 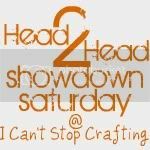 So, why not use this weekend to sew a curtain? twice with 504 Main -- oops, Janny got there first! I feel like a sewing machine these days. In a good productive way, I mean -- not because my tension's high or I'm on my last thread or any other bad sewing pun. My actual sewing machine has been cooperating pretty well with my current frenzy; I think it likes the attention. Here's my first successfully executed (more or less) vintage pattern. The instructions were pretty wacky but I improvised a bit along the way. 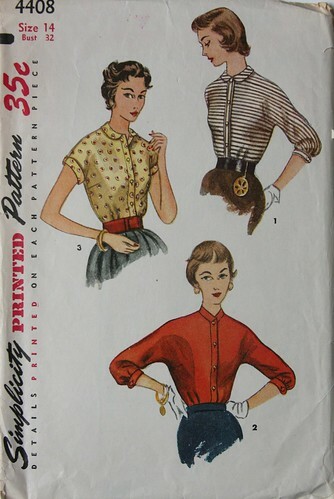 I used Simplicity 4408, view 3, a short-sleeve blouse with shaped cuffs and a small "peter pan collar." The pattern was published in 1953, which happens to be the same year Walt Disney released the original animated Peter Pan -- who by then had a pointed collar, Lord help us. 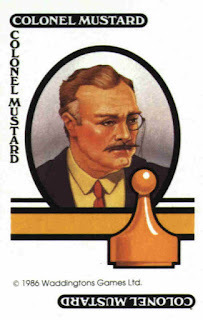 Apparently the character did have the soft rounded collar when he appeared for the first time in the 1904 play in England. By the time the mid-century rolled around, women and girls were sporting the look, and Disney wasn't gonna have any of that girly European nonsense. And they gave him tights and a waist belt, too. Phew, masculinity saved. Yea, I realize that Peter Pan statue above is strange. Who's that tiny bodacious lady looking up his dress? Anyway, thanks, Peter, for bestowing your adorable little collar upon us. The cool sewing bloggers of the 21st century are thrilled about its revival in fashion and the modern pattern industry. I do feel a little smug that I used an authentic vintage pattern for it, to be real. This is 100% cotton I bought on sale from Fabric.com awhile ago. I only had a yard of it, so used contrasting fabric for the collar, sleeve cuffs and button placket. The dart and tuck details of this blouse definitely have the mid-century vibe, which is lovely even if it makes it a pain to iron. This top is pretty cute but I really need to stop making garments that don't match anything else in my wardrobe. Or, uh, can't be worn in the current 35 degree weather. I believe the blouse is meant to be tucked in, but I don't really have a skirt that goes well with this minty green. Any suggestions for color pairings, fashionistas? Once upon a time, two days ago, there was a men's shirt that wasn't being worn. Not anymore, y'all. The shirt is Patagonia brand so it's very well made. Its content is 55% hemp and 45% organic cotton, basically my dream fabric. I love hemp fabric, I do. It lasts forever. I also respect Patagonia's environmentalism and the lengths they go to use sustainable textiles & responsible manufacturing processes. I think they'd appreciate my refashioning efforts. 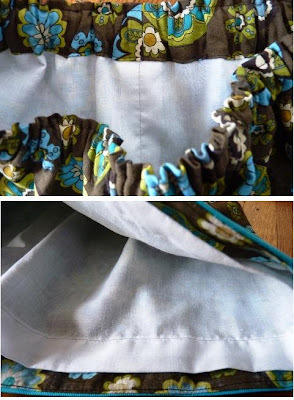 There are a few tutorials around the sewing blogosphere on how to make a skirt from a men's shirt (see here, here and here). - I kept the side seams, bottom hem and button placket intact. - I made the waistband from the shirt's yoke (top back), using a skirt pattern I have that I knew would fit. - I cut off another piece of the remaining button placket to use on the waistband, and stitched it on the front center so it would align. - I gathered the top edge of the front and back pieces to fit the waistband. - I used one of the sleeves to make belt loops. The waistband facing is bright blue cotton scrap. This was a very large black corduroy jumper from the 1970s (or so they say). I got it for $5 from the "rough rack" at the local vintage thrift store. I used Simplicity 2152, view E. I added an inch to the overall length, but it's still a bit shorter than the model's. I didn't lap the zipper in center back, and instead left the gold teeth exposed. What can I say, playas gonna play. It's a nice simple pattern, and came together really quickly and easily. I'm just glad to have an office-appropriate black skirt now. My last attempt at making a corduroy skirt was an epic fail, too, so I'm glad this one worked out. Apparently my hair is red today. For the waistband facing I used a cotton print in my stash. The cord would have been too bulky. During this time of major material consumption for the holidays, I hope you find some ways to reuse and repurpose as well. It's much more gratifying! Who uses tablecloths? Not me. Who wears skirts? Yeah, me. This is Simplicity 2512, a Cynthia Rowley design, view B. For the material I used a large copper-colored tablecloth with herringbone weaving. Thrifted for $4. It's actually pure coincidence that the Sew Weekly theme this week is garments made from household fabrics (curtains, tablecloths, sheets). That's just how I roll almost every week. The pattern's curvy sweetheart-like waistband reminded me of the Ginger skirt from Colette Patterns but I liked the gathers and shape of this skirt more (from the front, anyway). I wish I had made the belt tie longer, as some other reviews of this pattern suggested, so it could be tied in a bow. I followed the pattern exactly but my ties look thinner than the envelope model's. I made the pockets with thin beige lining from a deconstructed skirt in my scrap basket. I didn't want to use the tablecloth material for the pockets because of the bulk. 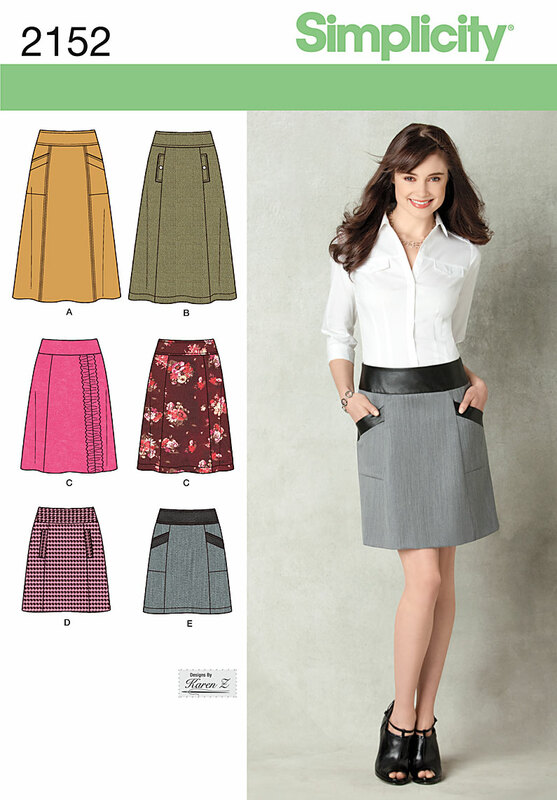 I wonder why pockets are so coveted in modern skirt/dress patterns. Does anyone actually carry stuff in there? I stopped carrying anything in my pockets after an unfortunate melting chapstick incident. Ain't stopping me from making them, though. They still look cute and have a cute name. Pocket. Yet another skirt for the "Wear only with long sweaters to avoid Teletubbiness" category. Yea, I have a couple of those now. Bummer. Another reason this sewing story doesn't have a happy ending: while removing the skirt after I modeled it, the zipper pull decided to pop off one of its tracks. (Yes, zipper pulls make decisions, as ways to spite me). I fixed it, which was a painstaking process, but then it just did it again the next time I unzipped the skirt. I believe it's because this material is fairly thick, and the waistband, facing, ties and binding all layered upon each other at the top is too much for the invisible zipper to handle. Maybe I'll replace it with a regular zipper, or I don't know. Any suggestions? ?